The National Oceanic and Atmospheric Administration has released their 2017-2018 Winter Outlook, which is predicated on the emergence of a weak La Nina event in the eastern Pacific. 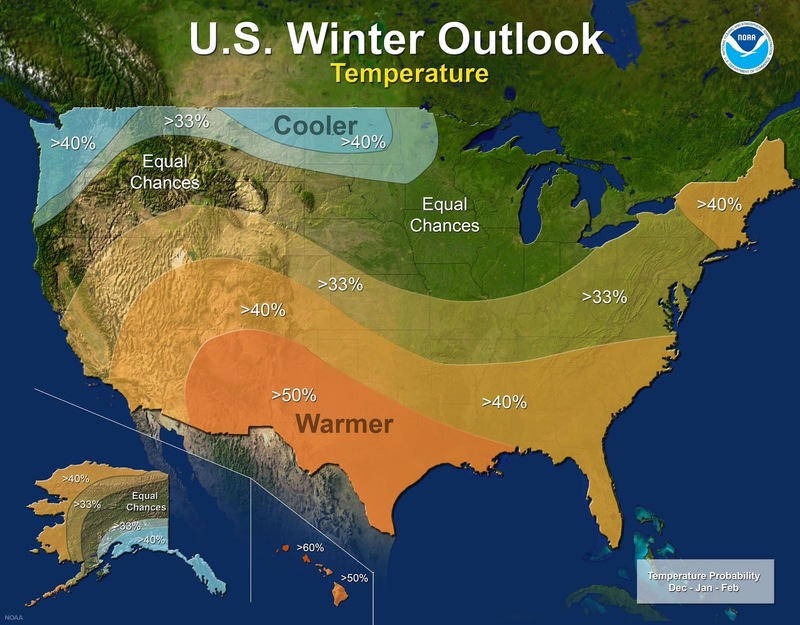 NOAA indicates that La Nina is likely to be "weak and short-lived," but will still have an effect on the weather patterns over the United States. La Nina typically results in cool and wet conditions across the northern tier of the country and warm and dry conditions for the southern U.S. as compared to an average winter. 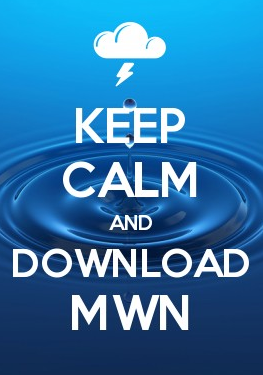 The outlook graphics reflect that general thinking. The temperature outlook calls for a broad area across the southern United States with a high chance of above average temperatures. Specifically, the most likely areas for above average warmth are from the Four Corners region across Texas to the central Gulf Coast. North of those areas though, there is a good chance of seeing above normal temperatures across the rest of the southern U.S. and potentially the eastern U.S. Memphis and the Mid-South is also expected to average above normal this winter in the temperature department. 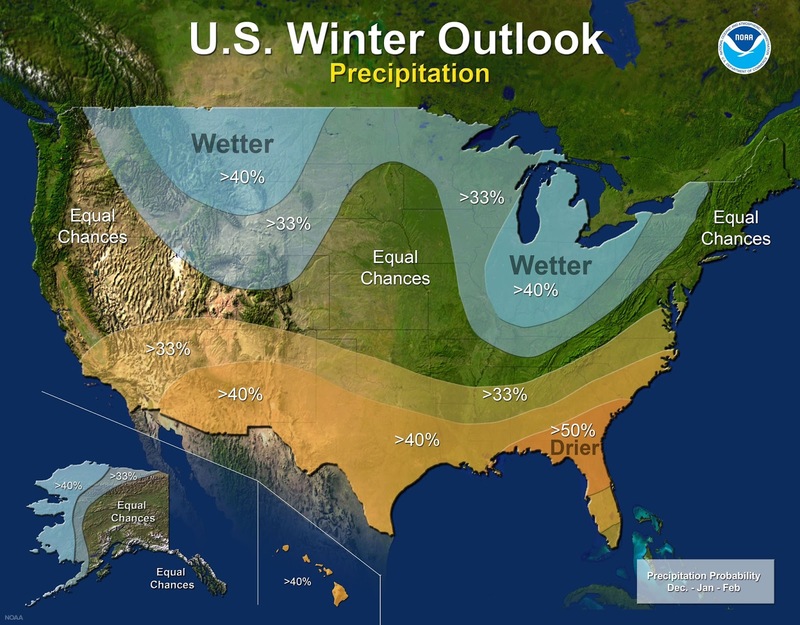 On the precipitation side, La Nina is well known for dry conditions across the southern tier of the U.S. and that is exactly what we see in the outlook graphic. The desert southwest, southern plains, Gulf Coast, and Mid-Atlantic are all forecast to end up drier than average. Areas that are likely to see above average precipitation include the norther Rockies, Ohio Valley, and central Great Lakes. The Mid-South is in an "equal chances" area, meaning there are no clear signals to indicate above or below precipitation. It should be noted that above average temperatures for a season do not necessarily mean a lack of winter precipitation in the Mid-South. The Memphis area averages about four inches of sleet and snow each year, though it tends to vary each winter around that average, from an inch of two to 5-6" or more during the snowiest winters. Of course, one or two storms can produce those amounts, so it really comes down to having the right mix of moisture and cold air simultaneously. In addition, ice storms can also occur when a rain event runs into a shallow layer of cold air, either behind a cold front, or when high pressure north of the region filters cold air south into the region. It's been several years since the area has seen "good" snowfall. The past six years have yielded a total of 7.1". 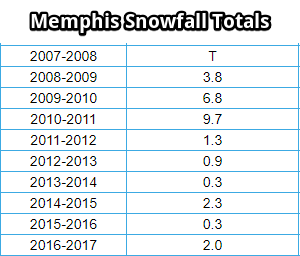 The two previous years, 2009-10 and 2010-11, recorded 6.8" and 9.7" respectively, with big storms dumping even higher totals that affected portions of the metro but missed the airport. Maybe this will be our year for another heavy snow! As an aside, it should be noted that La Nina can sometimes produce severe weather episodes in the late wintertime as well, so we'll need to keep an eye out for that potential as well.